Hey loves! The weather in FL is still super cold, and the whipping wind lately is definitely not helping. I'm sure most of you are saying "Honey, please stop complaining because where I live is FREEZING right now compared to FL." Yes, I know... we're spoiled in FL so when it drops below 60 degrees we're grabbing our pea coats. I'm sure this is the last of our cold anyways, and in about a week or two we'll probably be back in the 70's haha. Well enough about the weather -- how about this rad outfit I'm wearing?! Yes, I must toot my own horn -- my apologies, but I am ob-sessed with this vintage Lillie Rubin sweater. In fact, I'm ashamed that this is the very first time it's ever been debuted on the blog -- but hey, that's how I roll right? (always keeping my vintage tucked away until the perfect moment) Well last weekend felt like the perfect moment. 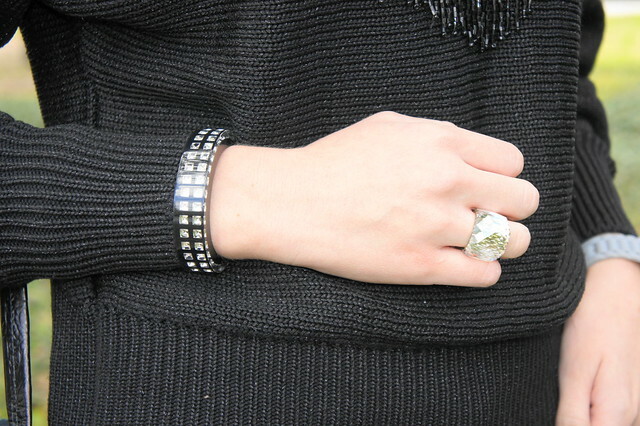 It was freezing, I wanted a nice thick sweater to wear, and then I remembered this lovely embellished Lillie Rubin one! I found it a couple years ago while on one of my many thrifting adventures, and it immediately caught my eye. 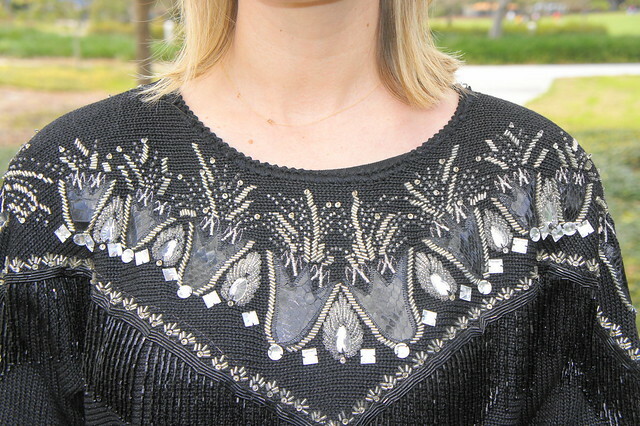 It's in incredible condition -- the beading is so intricate and I love how it has fringe too! Also love how there's specs of silver weaved into the fabric. So fun, right?! Since this sweater was so crazy cool, I knew I had to tone down the rest of my look. I kept my jewelry simple with a couple of my fave Swarovski pieces (they add just enough sparkle, but don't overwhelm), and my denim, bag, and shoes I kept black (to have a nice clean and minimal look). How do you think I did? What's your opinion of embellished clothing? I myself, am obsessed. If you missed my recent post featuring my vintage emebellished cardi, you can check it out HERE! Don't forget to enter my JewelMint giveaway! I will be picking THREE winners! Giveaway ends tomorrow, so don't miss out! :D Enter HERE! such a great look - love those boots! Love your bright lips with this look! Holy gorgeous look ...love all black and the little embellishments! Did you get a hair makeover?? SO Jealous...you and Tanya w your amaze bobs...and I am still too afraid to cut my hair! How are you and that beautiful baby?? ?